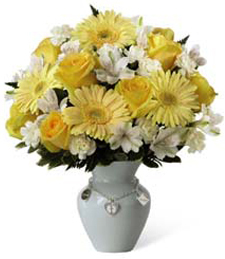 This colorful arrangement is the ideal means of expressing emotion. 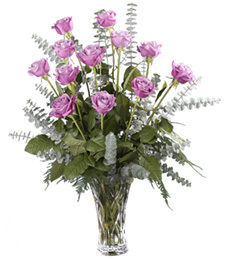 Delicate, yet bold, these softly-colored roses make quite the statement. 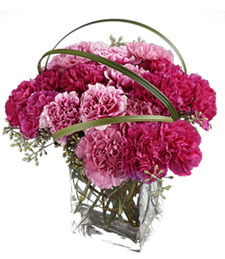 Show you care with these gorgeous blooms, and tickle that special someone pink. Once Upon a Time therein existed a beautiful young princess that lived in an enchanted castle in search of her handsome prince. Everybody has a fairytale to tell once in awhile. Some do come true as most dreams and visions. 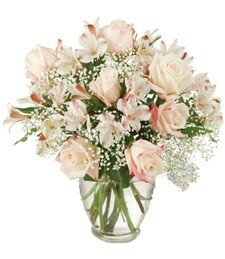 Make that special someone's dreams come true with an array of all pink blossoms that say absolutely dainty and feminine! 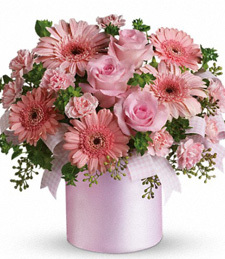 A plethora of pink flowers combined with delicate baby's breath creates this ode to beauty. 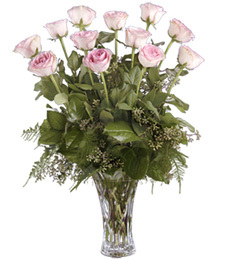 Flourishing with the elegance and style of an English rose garden set back in the days of old European tradition, these delicate pink blossoms influence a time of Precious Moments. Hear that song of springtime melody of a piccolo in the park and dive into the realm of profound romance and benign affections. Cherish every moment as if it will last forever! Sweet as the fresh nectar of a Georgia peach, these luminous peach roses take that special someone down the trip of memory lane when grandma used to bake fresh peach cobbler in the kitchen oozing with sweet fruity aroma! Grab that special someone by the hand and share those nostalgic childhood memories in a time where simplicity and laughter were the most important things life had to offer! 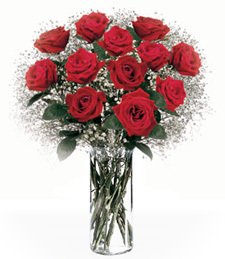 Classic�Elegant�Romantic�luxurious red roses are the utlimate regal sentiment of love! Highlight that special moment in time where everything in life becomes hazy except for the focus of that special someone. Dance the night away, twirl her around the dance floor, and step into the realm of passionate fantasy for true love comes once in a lifetime! 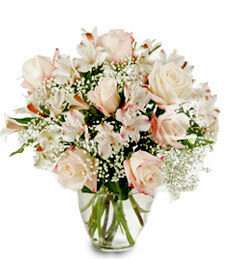 There are never enough way to say I Love You to that cherish someone in your life. 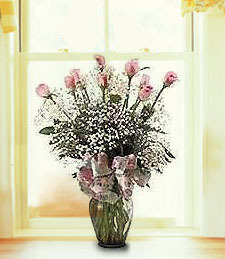 A Dozen I Love You's is one of many ways to show your deepest affections with big hugs and kisses for a smile is never wasted! 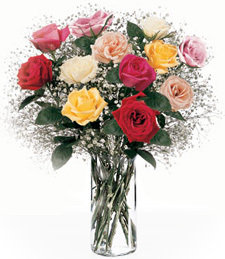 Embrace them with an assortment of fresh cut roses in hues of the rainbow for every shade has its meaning. 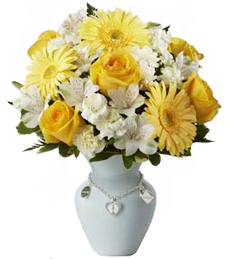 Cast an enchanting spell on that loved one for cherished memories in the mist last forever! Lift a toast to a life well done with an array of Champagne Roses to celebrate the essence of life! 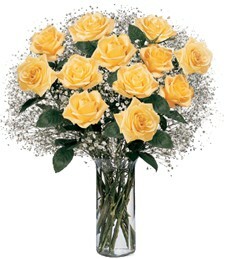 That special someone will be embraced with the most deepest affection from an unexpected accordance! For the girl who puts a spell on you, Hot Pink Love is the first love of your life like a high-school sweetheart you will never forget! 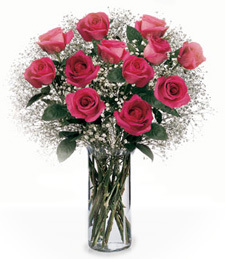 Be the first one to shower that special someone with young love with an enchanting feminine bouquet of hot pink velvety roses that brim with fashionable style and hot trendy color! A ravishing display of roses come from an unexpected accordance as a token of true love and deepest affections for red is the color of passion! In the essence of scarlet color, these velvety roses send a message of old-fashioned romance and chivalric courtship as seen in old films. She'll say "How Romantic". Everybody experiences the love of their life at some point in a lifetime. 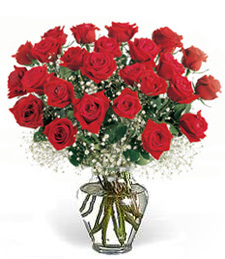 Two dozen velvety red roses send a message of love and companionship that special someone will cherish forever. Show them your intense affection with a token from the heart. Bask under the sun and end up Over the Rainbow! Dream and live like there is no tomorrow. Every moment counts so cherish it forever. 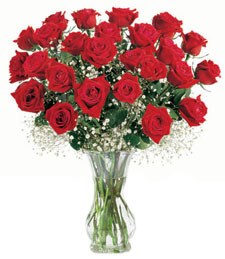 Have fun and live it up with an assorted array of luscious roses meant for that special someone right for any occasion. 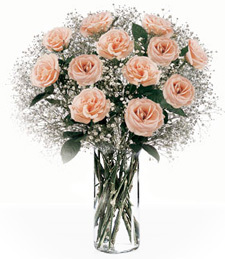 Make them blush with Rosy Cheeks and Smiles for a plethora of roses in the color of champagne add to the moment in the most unexpected way. Genuine affection and soft embraces cannot be mistaken for anything less than perfect. 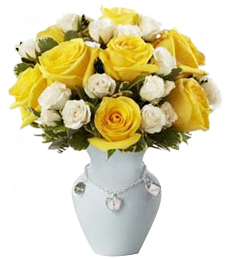 Send that message of love through an array of precious blossoms and your generosity will never be forgotten.